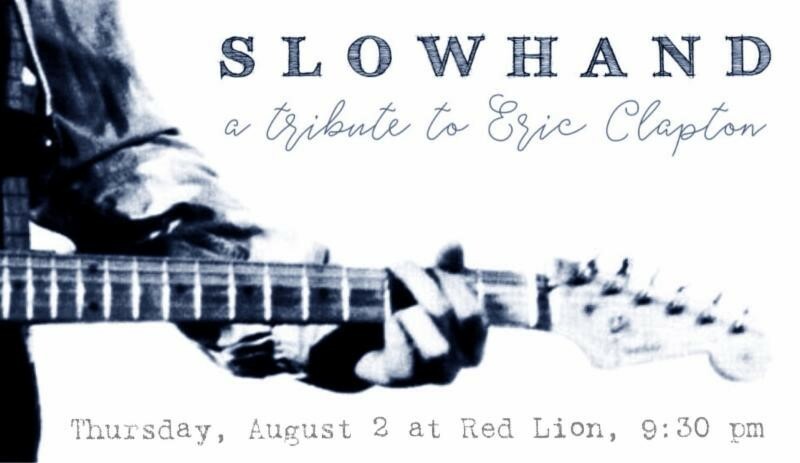 Historically speaking, our August Red Lion show tends to be very popular, and I’m not sure why – perhaps it is a “last hurrah” before vacation time or the kids come home from camp or the start of school? Whatever the reason, it’s a good time for a party, with several new bands, new faces, and new musical directions. In other news, the Jam will be moving…somewhere come mid-December, as The Collective plans on significantly expanding enrollment and using every scrap of space. Where will we go? Unclear at the moment, but we’ve weathered many such storms before, so I’m not worried. But I’m also grateful for anyone who has ideas, wants to help, etc. Lastly, there’s been some interest in us putting together another straight-up, relatively simple classic rock InstantBand to perform September 6 – and the answer is (always): If there are enough willing participants (say 4), we’ll make it happen. But we need to know this week in order to set it up. This Thursday (8/2), the Jam presents another delirious spectacle at The Red Lion (at the corner of Bleecker and Thompson). This edition features (with lineups of new and altered bands spelled out) mildly-electric duo PERISPHERE (this time: Amy Griffin, Gregg Raybin) at 7 pm, classic rockstars DEAD FLOWERS Steve Beasley, Joe Fortine, Robert Donigan, Ed Howe, Dave Lieberman) at 7:50 pm, heretofore heavy rockers (but this time something different) CRANK CASE at 8:40 pm, Eric Clapton tribute SLOWHAND (Ed Howe, Kaia Updike, Joe Fortine, John Holland, Amy Griffin, Gregg Raybin) at 9:30 pm, ostensible Beatles tribute NO MERSEY at 10:15 pm, and Rolling Stones clones THE ROLLING BONES from 11ish to 1:15 am. Many moons ago I talked about the benefits of trying to suss out the changes of a song for yourself rather than resorting to online charts (to recap: it improves your perception of different notes, chords and intervals), you may well stumble upon a more accurate (or more interesting) way to play the song, you’ll become better/faster at transcribing in the future – and a lot of charts and tutorials you find online are less than accurate – or worse). But AFTER you’ve transcribed a song, and are satisfied with its accuracy, seeing how others approach the same material might well be enlightening. I was recently working on a new song that someone on YouTube had adapted for acoustic guitar. “I start off playing the progression on just the top three strings,” the author said. “Ooh! Ooh! I GOT this!” I thought, having been dwelling on mining those strings for their chordal possibilities these past couple of weeks (see the 7/10/18 Flurry for more on “compact” chords). But I was wrong – even though I had discovered three different moveable shapes to produce major chords on the high strings, my guide showed me yet another moveable major form (though it was a little trickier, it sounded better (I think in part because it wasn’t an inversion, and also because of where it was played on the neck) and allowed for better access to a crucial little passing lick. Knowing different ways to voice chords (inversions, compact chords, implied voicings, CAGED system) gives you a broader palette, and allows you to string together sequences while staying more or less in the same fretboard position. Ironically, staying in one position guarantees more interesting tonal movement – some notes will be ascending, others will be descending (and others may stay the same (“pedaling”), which is interesting too). You can test this out yourself, but having ALL your notes sliding in the same direction is far less exciting to the ear. As a solo guitarist, knowing lots of shapes allows you to do things like imply a bassline, and create drama by building from compact to fuller chords. And this knowledge makes for better two-guitar interplay as well. Bottom Line: You don’t have to know EVERY possible way to play a given chord, but the more you know, the more valuable and interesting a player you become. A common flaw in drummers is that they lose a tiny bit (or more) of time at the end of a fill. A very wise teacher of mine used to say: don’t be like a typewriter (I know, a little outdated) – where you finish a thought and then hit Return to zip back to Point A. Instead, think circularly – you’re ALWAYS coming around, regardless of accents and fills. If you’re always feeling the time (rather than focusing on executing parts), even mistakes will pass by without an ugly lurch to get back on track. Playing with good time is far more important than correctly executing parts. Time flows continuously, and so should you. Thursday (8/2): Showcase at Red Lion – see ENTERTAINMENT, above. Saturday (8/4): Newbie Jam, under the inspirational guidance of Jimmy Fontanez, 3 to 5 pm at The Jam (541 Sixth Ave, inside The Collective). $15 for members, $25 for non-members. Designed for those who don’t have much experience playing with others, but open to all. ALSO Saturday (8/4): The Playlist – a jam session with a Facilitator TBD, from 3 to 6 pm at The Jam (541 Sixth Ave, inside The Collective). $20 for Jam members, and $35 for non-members.